Just because summer is almost over, doesn’t mean there’s nothing to celebrate. 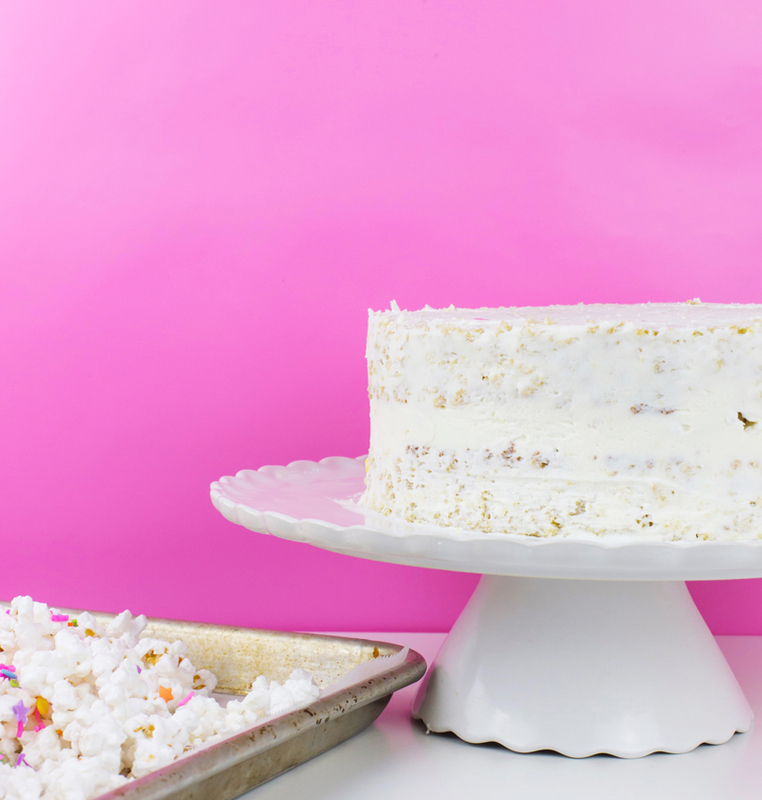 Cake is totally worth finding a reason to celebrate and I’ve got you covered with this delicious White Chocolate Popcorn Cake. 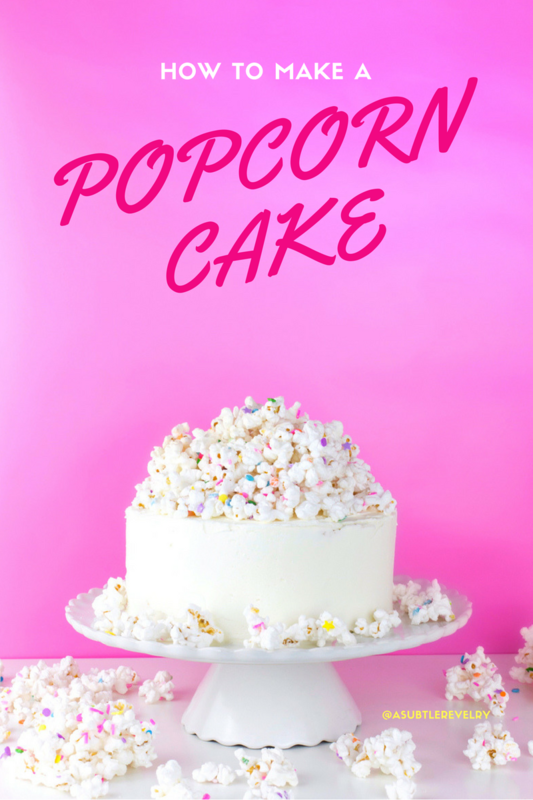 One of my absolute favorite things to do is combine my favorite snack – POPCORN with my favorite dessert – CAKE! Because who doesn’t love more of their favorites in one place? *I like to use the clear vanilla for this cake, it reminds me of that yummy bakery taste from when I was a kid. 1. Preheat your oven to 350 degrees and prepare your cake pans with parchment paper and a little butter (you can also use the non-foil butter wrapper from your buttercream). 2. In a bowl, sift together dry ingredients. In a separate bowl, combine all your wet ingredients. On low speed (with a stand or handheld mixer) slowly add the wet ingredients to the dry ingredients. Once combined, scrape down your mixing bowl to make sure everything was incorporated well. 3. Divide your batter evenly between your two cake pans. Bake at 350 degrees for 35 – 40 minutes until a toothpick comes out clean. Let cakes cool completely before assembling. 4. Mix together all ingredients and let steep for 20 minutes, then use a fine mesh strainer to remove all of the popcorn bits. This should yield 1 cup of popcorn milk for your cake. 5. In the bowl of a stand mixer (or handheld) with the paddle attachment, combine butter and a large spoonful of your melted chocolate on low speed. You’ll want to make sure your chocolate has had a little time to cool before adding it to your butter. Slowly begin to add your powdered sugar and alternate with another spoonful of chocolate until combined. Increase your mixer speed to medium and add your vanilla. 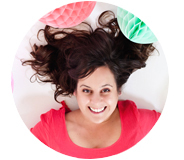 Your buttercream should be a nice, spreadable consistency. 6. Line a baking sheet with parchment paper. In a separate bowl, add your popcorn and begin to add your white chocolate. Now, it’s time to get your hands dirty! First, with clean hands, gently combine your popcorn and chocolate until it’s evenly it’s evenly coated. 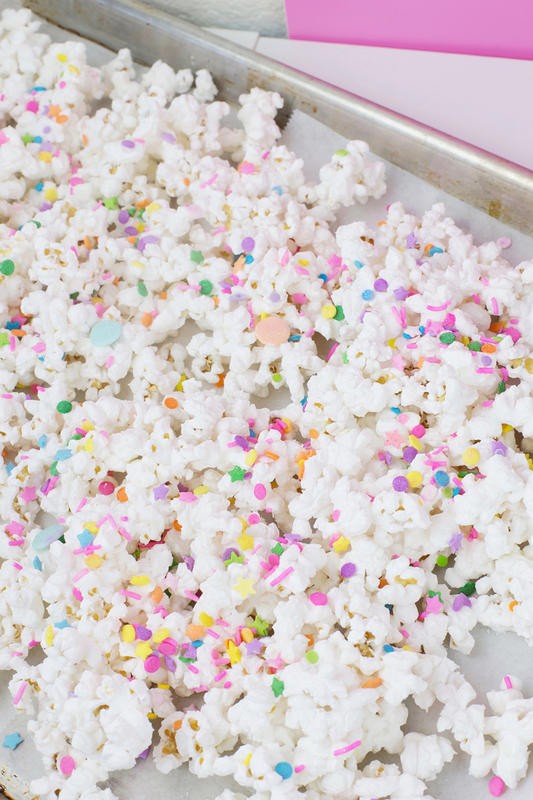 Place your chocolate coated popcorn on your lined baking sheet and add your sprinkles. You’ll want to do this fairly quickly so your chocolate doesn’t set before your sprinkles have time to stick! 7. Once the cakes are level, you’ll add a small smear of buttercream to your cake plate and stack your first layer. Spread about 3 tbsp of buttercream and a single layer of your white chocolate popcorn, then spread about ¼ cup of buttercream to make sure it all sticks together. Add your final layer and give your entire cake a thin coat of buttercream, so all those crumbs don’t try and escape. Stick your cake in the fridge for 10 minutes. 8. Now, take your plain-jane, crumb-coated cake and frost away. Don’t worry about getting this perfect, you’re going to decorate with a ton of popcorn. Just do the best you can and don’t worry if you can’t get that one spot, the popcorn will hide it! 9. 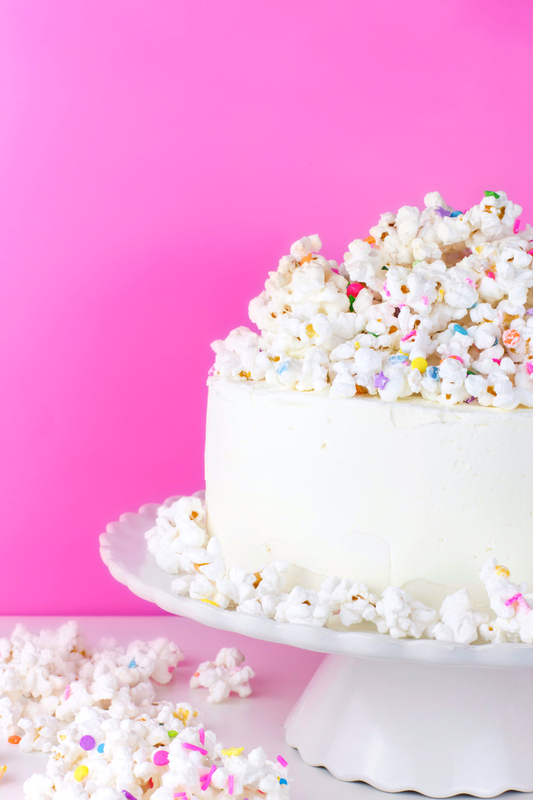 Finally, decorate the top of your cake with a heaping pile of white chocolate popcorn. 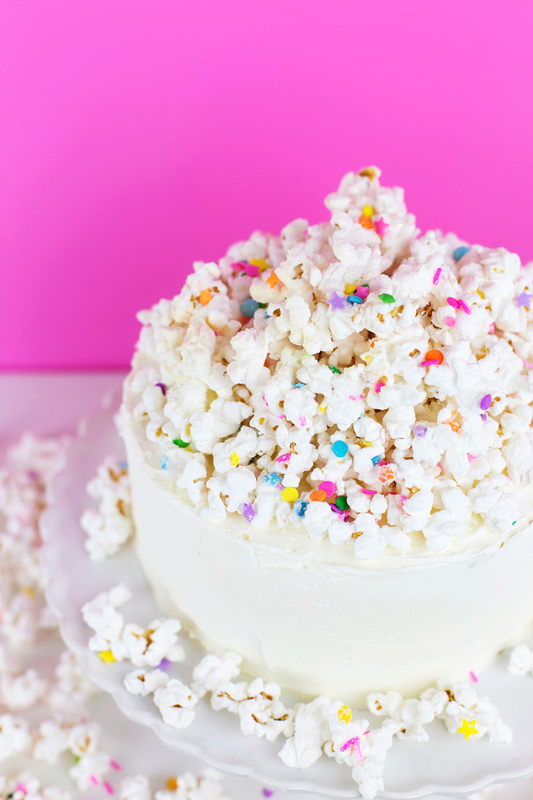 You might need to dip some of your popcorn in the leftover buttercream to use as a “glue” so your popcorn decoration doesn’t fall. Now for the best part! Slice that delicious cake and celebrate! 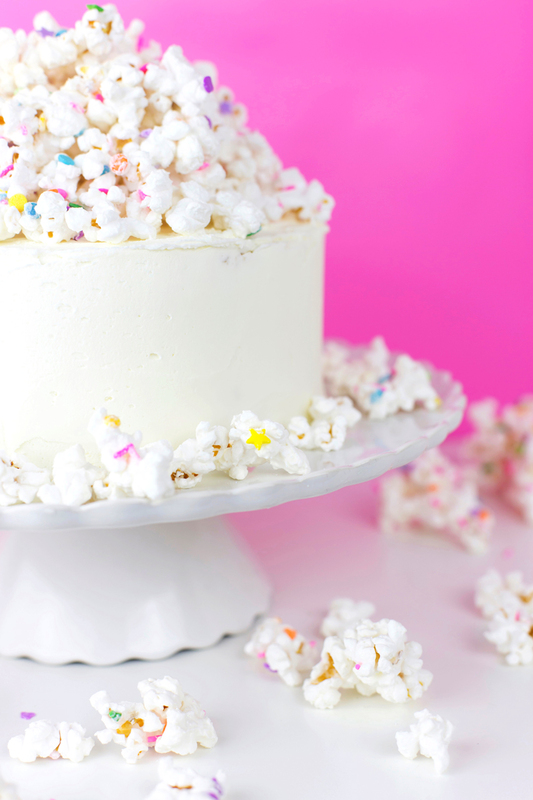 I love this cake so much because, well, it’s cake with popcorn, but you can totally customize it for whatever you’re celebrating. Spooky spider cake with orange and black sprinkles anyone? Halloween is just around the corner. Is this real life? That looks amazing! Love it!